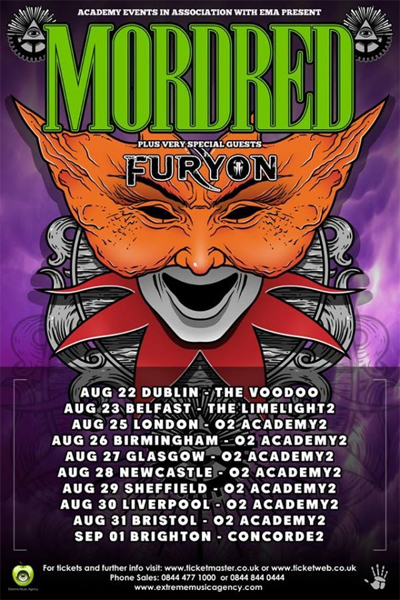 British thrash metallers FURYON have announced a UK Tour this summer with fellow thrashers MORDRED. Of the back of debut album Gravitas the band are going from strength to strength. With Album 2 being written and to record now, once again to be engineered and produced by US producer RICK BEATO (SHINEDOWN, FOZZY) and his team. FURYON looks to release their second beast later 2014. What’s to be expected is more of the same explosive guitar riffs and solos in well crafted song form. Expressive vocal delivery and melodies to scream along to. A possibly darker album still with progressive elements and a grungy edge. The album aims to be a 10 song album with additions (acoustic tracks and videos). FURYON are extremely excited and looking forward to sharing the outcome of this venture with the World. FURYON recently confirmed to play Hungary’s MetalWar Festival 2014, which takes place September 5th – 7th in Budapest and Belgium’s Power, Prog & Metal Festival 2014, which takes place April 18th – 20th in Mons. Other bands confirmed include: PAIN, IN EXTREMO, THERION, FINNTROLL, MY DYING BRIDE, AMORPHIS, FATES WARNING, MASTERPLAN, EXORCISM, FATAL SMILE and PAGAN'S MIND, to name only a few.